Galen Stone Tower is the focal point of campus, what its architect Charles Krauder called a “dream of dreams.” The original tower was made possible by the generosity of the late Galen Luther Stone, a Boston-based financier and philanthropist, and a trustee of the College from 1915 to 1925. On Tuesday, Galen Stone’s grandson (also named Galen Stone) visited the tower with his wife and a family friend to enjoy the carillon and commemorate the building. The tower stands 182 feet tall from the ground to its highest finial. The tower houses the 32-bell Wellesley carillon, which was installed in 1931. 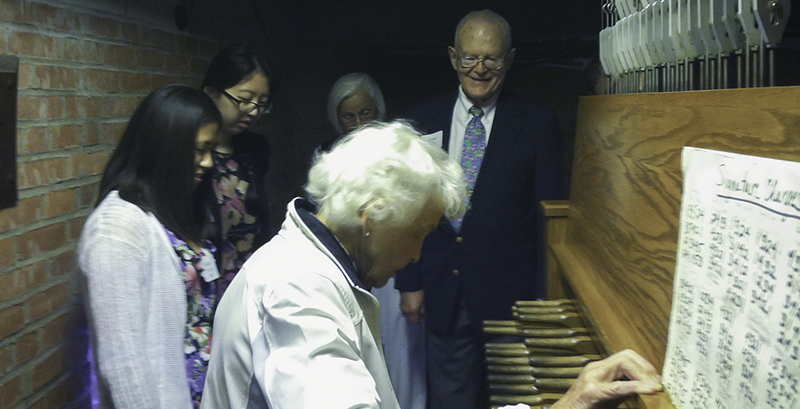 Aside from a few years during World War II, the carillon has been performed on by Wellesley students from the Guild of Carillonneurs since its installation. On sunny afternoons, during finals, and many other times during the semester, the Carillonneurs play an extensive repertoire ranging from classical pieces and Wellesley’s Alma Mater to Korean pop and Disney tunes. Perhaps the most iconic feature of the campus landscape, the tower and its carillon are immortalized in Wellesley’s own songbook, including the Alma Mater (“In every changing mood we love her / Love her tow’rs and woods and lake / Oh, changeful sky, bend blue above her”) and The Wellesley Blue (“And o’er them all, the tow’r on high / Bright-etched against the sky”). The Stone family has a longstanding tradition of supporting Wellesley. After Galen Luther Stone served as trustee, his son Robert Gregg Stone joined the Board of Trustees from 1954 to 1972, followed by Robert’s son David B. Stone who served from 1977 to 1995. The grandson and namesake of the tower’s donor, Galen Stone (pictured with his wife, Anne) has a long and distinguished career as a high-ranking Foreign Service officer, stationed in Germany, France, Saigon, and India. From 1976-1978, Stone served as the U.S. representative to the international Atomic Energy Agency; following this, he was appointed Ambassador to Cyprus. Galen and Anne have several children, and have multiple alumnae in the extended family. Taking an opportunity to explore the tower his grandfather made possible, Galen Stone came to campus yesterday with his wife, Anne, and their friend Mary Norton ’54. They had lunch with Margaret Angelini '85, Director of the Guild of Carillonneurs, senior bellringers Michelle Lam ‘14, Kaitlyn Schwartz ‘14, and Kellie Wo ‘14, and director of leadership gifts Sheila Zarba-Campbell. After lunch, the carillonneurs led the Stones and Norton up the tower on a tour of the carillon, and showed their guests how to play the keyboard which controls the bells. After the tour, the Stones and Norton descended from the tour and listened to a full carillon concert. The carillonneurs played several pieces, including Wellesley’s Alma Mater, Wellesley Nocturne, Beethoven’s Ode to Joy, and C.P.E. Bach’s Rondo.